The Concept-CT1 MIEV2 hybrid 4WD sport compact concept uses an outer rotor type in-wheel motors and a lithium-ion battery system to drive all four wheels. It is targeted at the growing sport compact category. This next-generation electric vehicle pairs the MIEV concept with a gasoline engine for series-parallel hybrid propulsion, which delivers higher power and realizes longer cruising ranges, to drive all four wheels. 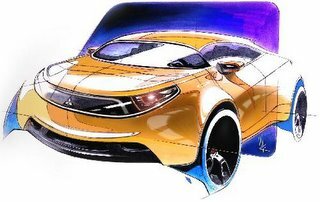 It was created by the Mitsubishi Motors R&D of America, Inc. design studio based in Cypress, California. The new Eclipse Spyder is a convertible version of the Eclipse sporty coupe the company showed at the Detroit Motor Show in January of this year. It features a soft top which opens and closes at the touch of a switch, with a new powered tonneau panel. The car is powered by either a 2.4-liter in-line 4-cylinder MIVEC3 engine or a 3.8-liter V6 MIVEC engine. Eclipse Spyder will be produced at the MMNA's facility in Normal, Illinois and is due to go on sale in the spring of 2006. Hopefully, they will ultimately make their way to the Malaysian market with the required modifications (left hand drive to right hand). Wah, the artist impression is really very impressive indeed. Immediately, my thoughts are driving the wonder baby on the Great Ocean Road to the Spectacular 12 Apostles. OK... get back to work.